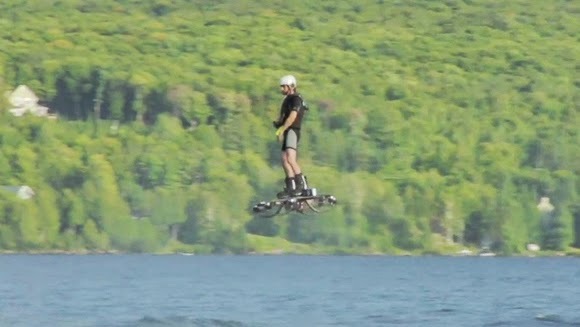 Romanian-born Canadian inventor Catalin Alexandru Duru managed to set one of the most amazing world records, flying over 275 meters on a hoverboard he designed himself. The world record attempt took place in August 2014, but Guinness World Records made it official for the first time on Friday, May 22, 2015. Catalin Alexandru Duru was born in Suceava, in northern Romania, but he left the country when he was only seven, as his family moved to Casablanca in Morocco. Ten years later he moved to Montreal in Canada. The hoverboard concept first appeared in the Back to the Future II Sci-Fi movie, in 1989, and quickly became very popular. The hoverboard also appeared in Spider Man movies (The Green Goblin flew one), and in the Fantastic Four: Rise of the Silver Surfer movie. However, it took 25 years for this concept to become real, with Duru’s invention. "The prototype can be used anywhere but is usually tested over water because of how dangerously high it can fly,” Duru explains in the video of the record-breaking attempt above. It's a propeller-based system - from the footage it looks as though it's a quadcopter-type set-up. This is a different approach to other attempts, which have used the power of magnets repelling each other, or water power to levitate off the ground. There's no word on when (or if) this prototype might be commercialized, but we're sure it's something Duru will be looking into, given the hype surrounding hoverboards. The flight lasted a distance of 275.9 metres (905.2 feet) at a height of almost five metres. Given that Duru only had to reach 50 metres to make the record, he smashed it. Cnet confirmed the authenticity of the record and the video over email with the team over at Guinness World Records.